There was a time when if you wanted something to eat, you had to get the ingredients to make it yourself. Today’s modern conveniences of packaged pre-cooked dinners and drive-thru’s have meals ready to eat in minutes, however it comes with a price that has nothing to do with money. These foods contain chemical preservatives that were never intended to be ingested by people, and yet we are spending millions of dollars each year on TV dinners, canned meals, and fast food. It’s no wonder that Americans suffer from a myriad of health problems if this is what we are continually putting into our bodies. One recent case in Great Britain has hit the news and it shows a very vivid, if not typical, example of the damage processed foods can do. Stacey Irvine, a seventeen year old factory employee collapsed on the job and was unable to catch her breath. 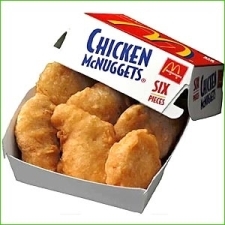 When she went to the hospital for examination, it was discovered that since the age of two, she had eaten an almost steady diet of Chicken McNuggets from the grand poobah of fast food chains – McDonalds. That’s fifteen years of no fruits, no vegetables, and very little else other than nuggets of mashed chicken bone and chemicals deep fried in some oil! Now of course we are all exclaiming over the choice of this girl’s mother to allow her daughter to eat this type of food constantly. But before we get our judgmental knickers in a knot, let’s take a look at some of the foods that are every bit as bad – and are consumed by us on a daily basis. Think about how many times a week you open a can of spaghetti rather than taking the time to fry the hamburger, prepare the sauce and boil the pasta. Rather than make a call on someone else’s choice, we need to truly examine our own. There are literally thousands of chemicals used in processed food! The reasons that are put forth are that the food has a longer shelf life, has brighter colors, and more enhanced flavors and textures. All of it is put together in brightly colored packages that are put out prominently in the store or advertised at your local fast food restaurant. Many of these chemicals have uses that seem far from anything we would be putting into our bodies, and yet we do so daily even though they are printed on the label for us to see. That’s not to mention harmful chemicals such as acrylamides that are formed during the processing of these foods – and are NOT required to be mentioned on the labels. Take a look at the names of some of these chemicals that go into our “convenience” foods – you will do good to pronounce them, let alone understand what they mean. However, simply looking up the names found on the food labels can yield much information about what is actually in there. Here are some commonly found in food and drink products, along with their other uses. …and you have just read but a small portion of the ingredients for – a processed strawberry milkshake. Makes you want to go out and get one, doesn’t it? And that is only the tip of a very large iceberg of processed chemicals we allow ourselves and our children to eat each day. So much of what we see in the grocery stores is processed, that it is hard to zero in on just a few that are particularly bad. To sum it up, if it comes in a can, is frozen, or is in a box, it is processed and likely has a list of ingredients a mile long with names that it takes a bachelors in science to pronounce and understand. Fast food restaurants are filled with processed food choices, many of which are geared toward children. We will look at some of the worst offenders of the processed nightmare that has become American’s food choices. 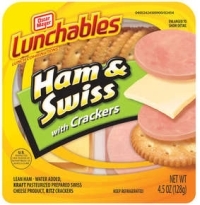 Lunch kits (Lunchables, etc. ): These plastic boxes contain crackers, processed cheese, processed lunchmeat, along with a packaged drink and either a candy bar or a cookie for dessert. There are other ones that even contain chicken nuggets and pizza which don’t require cooking. Very easy and convenient to pull out for the kids lunch, and one might even fool themselves into thinking that it’s halfway nutritious. However, the sodium and fat content for these lunches are more than what an adult needs let alone a child. Mornings are often hectic,and grabbing a box of doughnuts or throwing some Pop-Tarts in the toaster sounds like an easy way to slide through the morning breakfast. However, a look at the fat, sugar, and preservative content shows that these foods are horrible ways to start the day. Even worse are McDonald’s “Big Breakfast” meals with a whopping 1,920 mg of sodium. Keep in mind, the RDA of sodium is no higher than 2000 mg a day, and even that is higher than we need – but for one meal to contain nearly an entire days worth is as unhealthy as it gets. Foods such as packaged bacon have a sodium content per serving of well over 2000 mg, and that is just for part of a meal. The first and most important thing you, as the consumer can do is to stop buying foods that have more ingredients you can’t pronounce than ones you can. This is easier said than done, but it is not as difficult as we have talked ourselves into thinking. Buying food in the state that it was meant to be purchased in will not only make you healthier, it will actually taste better. These processed foods have salt and flavor enhancers to give the illusion of tasting better than they do. Try a vine ripened tomato or meat that has been prepared at home after being cut by hand by the butcher. Compare that to a processed can of spaghetti and meatballs and see what you think. Taking the time to prepare meals in advance can save time throughout the week if the family has a busy schedule. There are containers and freezer bags available to where a large meal can be made on a day that is free and can be portioned into meals for the week. Make the snack foods that are healthy more readily available – because when it comes to kids they truly will eat what is there if they are hungry enough. Don’t make the mistake of the mother whose daughter collapsed at work because of a steady diet of McNuggets. Kids learn very early how to get what they want and it is up to parents to be sure that they get what they need. Any minor battles about it in the beginning will wear down and your family’s health is worth it. Many people have started growing their own food or frequenting farmer’s markets to have more control over what they are consuming. Whatever action you take, it is important to take that action now. These food companies and fast food corporations couldn’t care less about your health. Start writing down the ingredients in these canned and boxed foods and then look up what they mean and what other uses they have. You may be alarmed, you may be shocked – but if you see it in black and white, you just may take action.